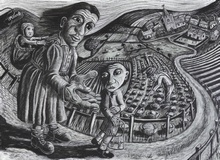 Julian Ruddock - To school in Llanfihangel - Online gallery supplying original fine art. Trending Modern British and Contemporary Welsh. Available for sale from Big Sky Fine Art; this original mixed media artwork by Julian Ruddock; dating from the 1990s.<br> The work is presented and supplied in a sympathetic contemporary frame, mounted using conservation materials and behind non-reflective glass.<br> Provenance: In the previous ownership of the artist Mabel Pakenham-Walsh 1937-2013 and then handed back to the artist after her passing.<br> The artwork is signed lower left.<br> <br> Currently living and working near Aberystwyth, Ceredigion, on the west coast of Wales, Julian Ruddock is an exceptional British artist with a strong interest in the environment. This interest has found expression through the practice of landscape painting and the production of site-specific sculpture, mapping projects and installation work. He is interested in the production of works that investigate the interaction of natural environment with human histories, in particular the discourse on environmental art based practice and climate change. Indeed, this was the subject of his PhD at Aberystwyth University. Ruddock’s interest is to combine traditional means and modern media to foster awareness, enquiry and expression of the environment.<br> <br> Ruddock completed a Foundation Course at the University of Gloucestershire from 1985-86. In 1997, he graduated from Aberystwyth University with a First Class Honours Degree, BA in Art and Art History. He went on the complete his MA in Fine Art at Aberystwyth, then his PGCE at the University of Newport. Between 2010-17 he completed a PhD at the Aberystwyth University School of Art. <br> <br> Between his studies, he has been employed as a Lecturer in Art and Art History at Coleg Ceredigion, previously teaching at Lifelong Learning, and the Aberystwyth School of Art. As a teacher and mentor he has been well respected and highly influential. <br> <br> Throughout his career Ruddock has also worked as a self-employed artist and has taken part in a great many selected exhibitions throughout the UK, and also Australia. <br> <br> Ruddock’s PhD was in practice-based Fine Art and the aim of his research was to develop projects that are based on art and science collaboration in relation to climate chance. This has taken him from rivers in Wales to the remote and arid regions of Southern Ethiopia. <br> The intentions of the art/science collaborations stem from an interest in landscape evolution, human impact on the environment and recognition of the need to communicate climate change research to a wider audience.<br> <br> Recent years have seen increased collaboration between the sciences and arts, with conferences, galleries and residencies devoted to exploiting the mutual benefits that can arise from mingling the two<br> Spheres. Ruddock has been an active member of the Visualising Geomorphology Working Group, whose remit is the promote the science of geomorphology through engagement with the arts.<br> <br> Recently, Ruddock joined a delegation of earth scientist to Ethiopia to record their research on climate change. The work centered around a remote region of Southern Ethiopia where the researchers collected sediment drill cores for analysis close to some of the world’s most important fossil and artefact sites. 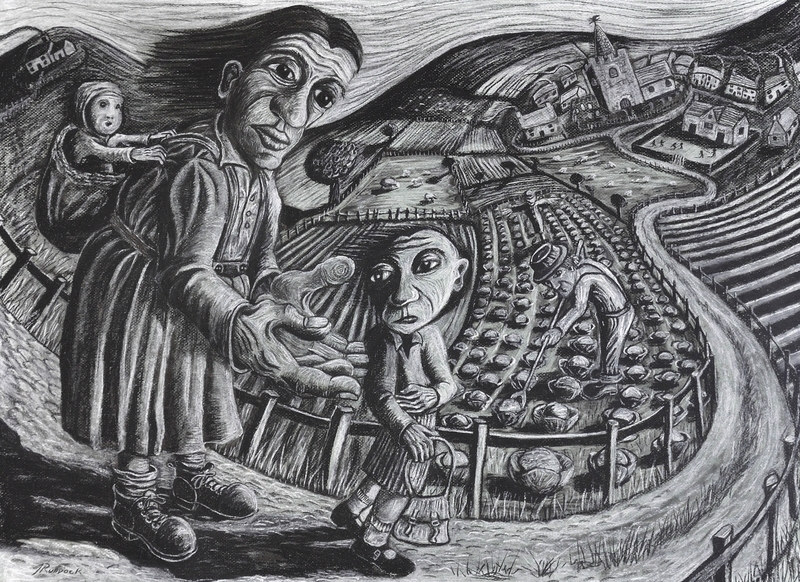 His role as part of the team was of an artist in residence and his images and film work played an important part in chronicling the work of the project. He also captured fascinating imagery of the local tribes people.<br> <br> Ruddock said; “My biggest remit is to work with the scientists and get involved with the communication of their findings. The idea behind it all is that scientists are very good at doing the science, obviously, but it is artists who are good at the communication side. The project is looking at how climate might have affected human evolution hundreds of thousands of years ago. They think that there are various factors that<br> might have caused human change and human evolution at various points in history, and think that climate was a significant part of that.”<br> <br> Ruddock reflects; “When we talk about climate change in the West we talk about where these effects are going to happen; actually they are happening in the places that didn’t cause the problem in the first place. So these people are getting increased droughts.”<br> <br> An amazingly talented artist, with sound practical and academic credentials, Julian Ruddock is a man on a mission. His works are unique, and speak from both the head and heart. They are set to become very collectable amongst a generation that is waking up to their message.<br> <br> This original pastel on paper depicts a special memory for the artist; it is his eldest daughter’s first day at school. It is a very rural scene. In the foreground there is a small girl, dressed neatly in her new woolen pullover, skirt, socks and shoes. She is holding a small satchel and looks somewhat reluctant to continue her journey, apprehensive of what lies ahead Behind stands her mother, tall, calm and full of encouragement. She has her hands out in support, urging her daughter forward, physically and metaphorically. These are disproportionately large hands – these are the hands that work, the hands that achieve things in this family. These are important hands. A mother’s hands, the hands which will guide the child will into the larger world. The mother figure is dressed modestly in a dress and boots. Hers are utility working clothes, and we wonder what she has sacrificed to make sure her daughter is properly turned out. She carries a smaller child on her back, in a basket or carrier. This child is still in her care, in constant contact. The path to the village is long, and winding. There is grass growing down the centre of the path, and wooden fences either side. But the route is clear. It passes fields in which a farmer is working, hoeing his cabbages, and other fields in which there are sheep grazing. The school look welcoming; there are children already in the playground, snug within the village, with its Church and cluster of houses. Beyond are the rolling hills of west Wales and the open skies<br> For the artist, this is an unusually optimistic piece, and a very personal one. It is about a little girls’ first day at school but it is also about the inevitability of growing up and going out into the world, and because of this, it is also an image of hope. Available for sale from Big Sky Fine Art; this original mixed media artwork by Julian Ruddock; dating from the 1990s. The work is presented and supplied in a sympathetic contemporary frame, mounted using conservation materials and behind non-reflective glass. Provenance: In the previous ownership of the artist Mabel Pakenham-Walsh 1937-2013 and then handed back to the artist after her passing. The artwork is signed lower left. Currently living and working near Aberystwyth, Ceredigion, on the west coast of Wales, Julian Ruddock is an exceptional British artist with a strong interest in the environment. This interest has found expression through the practice of landscape painting and the production of site-specific sculpture, mapping projects and installation work. He is interested in the production of works that investigate the interaction of natural environment with human histories, in particular the discourse on environmental art based practice and climate change. Indeed, this was the subject of his PhD at Aberystwyth University. Ruddock’s interest is to combine traditional means and modern media to foster awareness, enquiry and expression of the environment. Ruddock completed a Foundation Course at the University of Gloucestershire from 1985-86. In 1997, he graduated from Aberystwyth University with a First Class Honours Degree, BA in Art and Art History. He went on the complete his MA in Fine Art at Aberystwyth, then his PGCE at the University of Newport. Between 2010-17 he completed a PhD at the Aberystwyth University School of Art. Between his studies, he has been employed as a Lecturer in Art and Art History at Coleg Ceredigion, previously teaching at Lifelong Learning, and the Aberystwyth School of Art. As a teacher and mentor he has been well respected and highly influential. Throughout his career Ruddock has also worked as a self-employed artist and has taken part in a great many selected exhibitions throughout the UK, and also Australia. Ruddock’s PhD was in practice-based Fine Art and the aim of his research was to develop projects that are based on art and science collaboration in relation to climate chance. This has taken him from rivers in Wales to the remote and arid regions of Southern Ethiopia. The intentions of the art/science collaborations stem from an interest in landscape evolution, human impact on the environment and recognition of the need to communicate climate change research to a wider audience. Spheres. Ruddock has been an active member of the Visualising Geomorphology Working Group, whose remit is the promote the science of geomorphology through engagement with the arts. Recently, Ruddock joined a delegation of earth scientist to Ethiopia to record their research on climate change. The work centered around a remote region of Southern Ethiopia where the researchers collected sediment drill cores for analysis close to some of the world’s most important fossil and artefact sites. His role as part of the team was of an artist in residence and his images and film work played an important part in chronicling the work of the project. He also captured fascinating imagery of the local tribes people. An amazingly talented artist, with sound practical and academic credentials, Julian Ruddock is a man on a mission. His works are unique, and speak from both the head and heart. They are set to become very collectable amongst a generation that is waking up to their message. For the artist, this is an unusually optimistic piece, and a very personal one. It is about a little girls’ first day at school but it is also about the inevitability of growing up and going out into the world, and because of this, it is also an image of hope.